GOKPOP | Exclusive K-News in Malaysia & Singapore: 2017 SEVENTEEN 1st World Tour "Diamond Edge" in KL: 60% Tickets SOLD OUT! 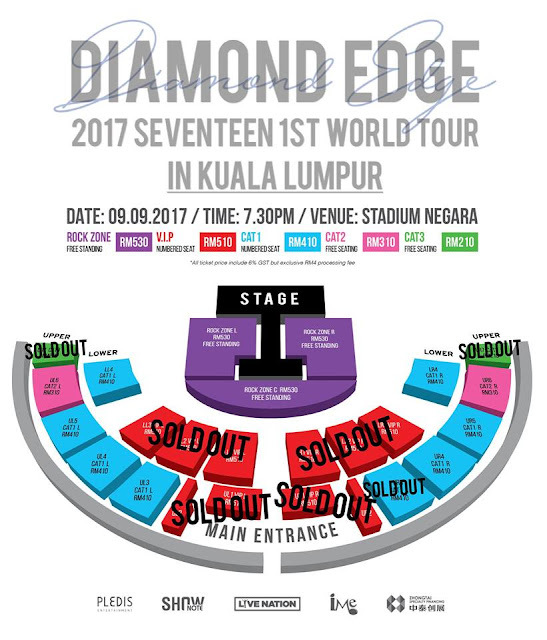 2017 SEVENTEEN 1st World Tour "Diamond Edge" in KL: 60% Tickets SOLD OUT! On 9th July, ticket launch of Seventeen 1st World Tour "Diamond Edge" in KL attracted hundreds of Carats (Seventeen fandom name) queued for the tickets. Organiser IME Asia also pleased to announce that approximately 60% of the concert tickets have sold out. After the ticket launch announcement, many fans were more than excited and started to queue at Sunway Velocity Mall which is the ticket launch venue and hoping to be the first to grab the tickets. Some of the fans even queued for a week in order to grab the tickets. Irene Lau, 21, a diehard fan of Seventeen successfully bought the rock zone tickets after a week queue. Not only that, there are fans came all the way from Ipoh to buy the tickets. Rachel Tan, 26, from Ipoh grabbed 44 rock zone and VIP tickets thanks to her effort and friend's help. Seventeen once again proved their outstanding popularity in Malaysia. Number seated, V.IP tickets and Free Seating, CAT 3 tickets have sold out but Rock Zone (RM530), CAT 1 (RM410) and CAT 2 (RM310) are still hot selling via Ticket Charge and its selected outlets: Speedy video, Rock Corner, Neway Karaoke Box, TicketCharge KL office, Quill City Mall information counter at the Mines shopping mall and 1 Shamelin. For outstation outlets, you may visit Eden Ultimate (Kuantan), Blonde Brunette (Penang) and TicketCharge office (Penang & Kuala Lumpur). For ticketing inquiries, kindly contact Ticket Charge hotline at +603-92228811.